Having gotten a taste for Nordic Noir I’ve now been given the opportunity to read the man hailed as one of the fathers of the genre – Gunnar Staalesen. 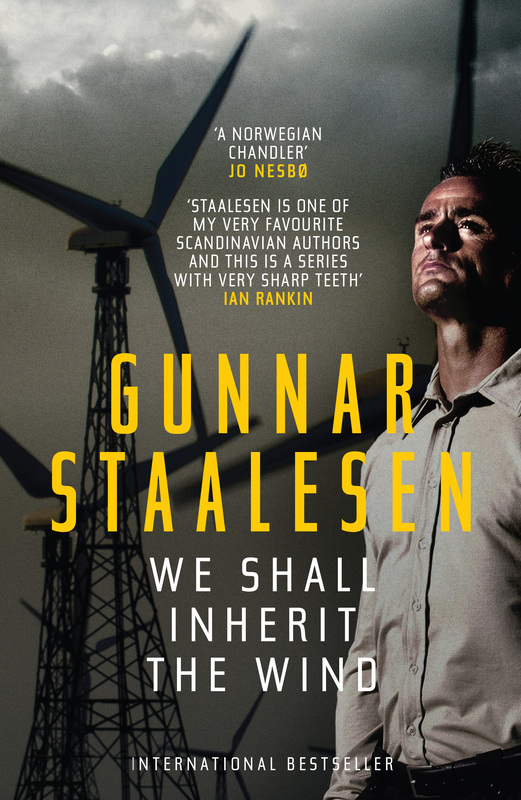 First published in 2010 in Norway, We Shall Inherit The Wind is the 18th novel in the Varg Veum series and now published in English by Orenda Books (if ever there’s a publisher to follow devotedly it’s Orenda Books) with translation by Don Bartlett. Set in 1998, Staalesen’s private investigator Varg Veum sits at the hospital bedside of his long-term girlfriend Karin as she battles life-threatening injuries bought about by the events surrounding Varg’s latest investigation. From here Staalesen takes us back – by “barely a week” – to re-trace those events (when I re-read that line for this review I had to read it twice as so much is packed into just a few days). Given how we know where they lead, the edge of the seat is pretty much all you’ll occupy from here on in. This ominous start leads us into a missing-persons case, with Veum pretty certain that the missing man – Mons Mæland – is already dead. Veum’s initial digging into Mæland’s affairs opens up a Pandora’s Box of questions with no clear answers. Every clue seems to point toward a more complex mystery which becomes all the more thrilling when Mæland is found dead – in a most dramatic fashion – and the plot thickens. Location is key. While Veum operates out of Staalesen’s own Bergen, most of the action takes place on the fictitious Brennøy and nearby islands. We’re a little outside of the comfort-zone here, you got the sense that you’re out in the wilds on each occasion that Veum leaves Bergen behind, with civilisation just a little too far over the horizon – indeed, law and order needs to arrive via helicopter. …the trees stood like dark monuments to a time when not only the mountains had to be clad but every tiny scrap of island skirted by the fjord. Accordingly spruces lined long stretches of the Vestland cost. No one had thinned the striplings, and no one had cut down the trees except the cabin owners who had desperately tried to clear themselves a place in the sun. It looked as if they had given up here ages ago. So much to love in that paragraph alone… “dark monuments”…. “desperately tried”… “given up here ages ago”… you almost have the “abandon all hope” sign nailed to the start of the chapter. Far from being a run-of-the-mill who-dunnit, We Shall Inherit The Wind is an intense read, pulling in eco-terrorism, religious fanaticism, corruption both at corporate and local-government level, plot twist after plot twist and a cast of characters with plenty of secrets and hidden connections. Two, three, four times I thought I’d sussed out who was behind Mæland’s murder only to be left utterly open-mouthed by the final reveal with Veum keeping his cards close to his chest right until the bitter end. I’ll admit I also felt like I’d been emotionally sucker-punched come the end, having been so caught up in the mystery as to be left open for the impact of the human consequences. Varg means “wolf” in Norwegian and the novel approaches the plot just as a wolf its prey; elements come together piece-by-piece, as the wolf slowly and assuredly stalks it prey Varg is a wise hunter, patiently letting events unfold with delicate pacing. Rather than rushing in and barrelling along at a frantic pace there’s long drives and ferry rides (the novel is set in the fjords of Norway, not down-town LA afterall), a stealthy gathering of every shred of evidence (and a lot of people’s cages rattled) before going in for the violent and bloody climax. Gunnar Staalesen is clearly a master-at-work by now, having first introduced the world to Varg Veum back in 1977. The prose is richly detailed, the plot enthused with social and environmental commentary while while never diminishing in interest or pace, the dialogue natural and convincing and the supporting characters all bristle with life. A multi-layered, engrossing and skilfully written novel, there’s not an excess word in We Shall Inherit The Wind. It’s a slow-building exercise in suspense that’s 100% addictive, one that gets you in the wolf’s jaws with the first few lines, sinks its teeth in and won’t let go until long after the finale. After my first dip into the world of Varg Veum I’m left wanting more. With We Shall Inherit The Wind I’ve been afforded a snap-shot into the life of a very complex but nonetheless endearing and relatable character and anxiously await the next two instalments from my favourite publisher. Though I may search out the earlier two novels to have made it into English. 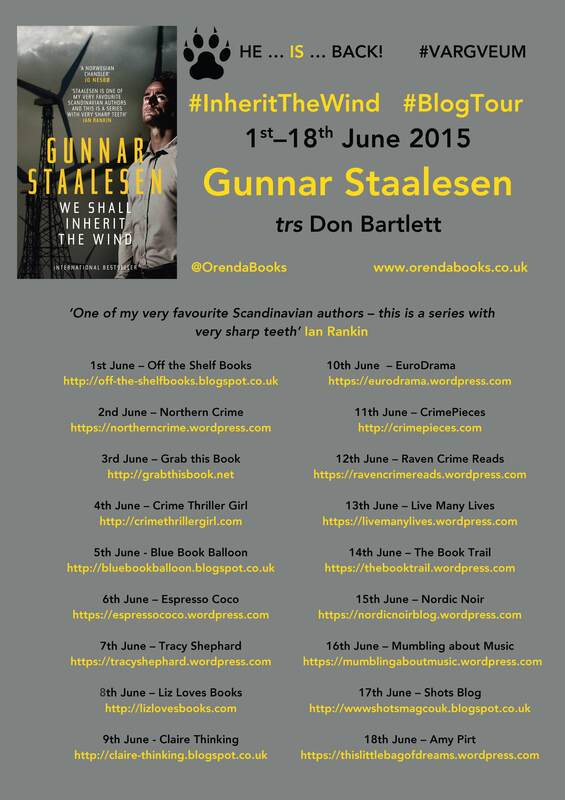 I’m one of the last stops on the blog tour for this novel so do check out those that have come before me including yesterday’s great interview with Staalesn at Nordic Noir and get your hands / kindle / e-reader / whatever on a copy of this hugely rewarding read via Orenda.